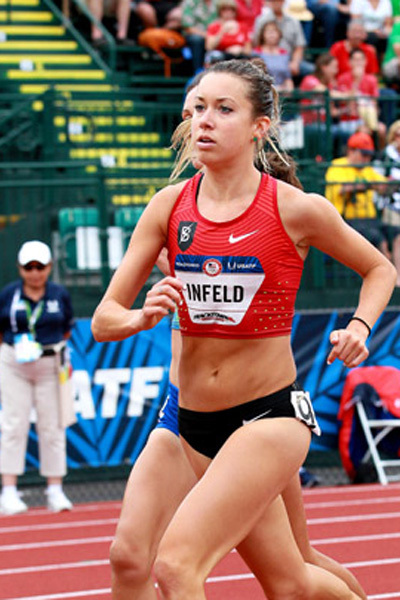 In only her second race of the year, Emily Infeld placed second in the USATF 10,000 Thursday night to earn a trip to August’s World Championships in London. On a day when the meet schedule was scuttled to account for extraordinary heat, Emily’s time of 31:22.67 was a 4-second PR. U.S. record holder Molly Huddle won in 31:19.86. Emily’s teammate and training partner Shalane Flanagan boldly led the first 20 of the race’s 25 laps before finishing fourth in 31:31.12. The race was only Shalane’s second since last August’s Olympic Marathon, and she knew she needed to keep the pace honest because a lack of workouts wouldn’t serve her well in a kicker’s strategic race. Colleen Quigley (second in the first heat) and Courtney Frerichs (first in the second heat) easily advanced to Saturday’s steeplechase final. Izaic Yorks placed eighth in his 1500-meter qualifying round and didn’t advance to Saturday’s final.